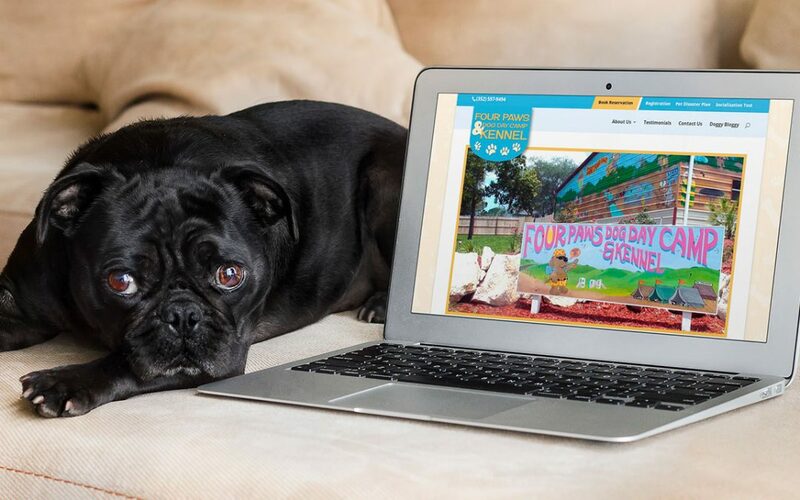 Four Paws Dog Day Camp and Kennel is happy to announce the launch of our new website. Feel free to have a look around and learn about our facilities, grounds, and boarding options. Our dog kennel understands that dogs crave companionship and get great benefits from playing, eating and sleeping together. Socialization and exercising together are important during their day here at our boarding facility. Our new website includes important information that dog owners are looking for to help them choose a dog boarding facility, including information and pictures about our kennel and grounds, our hours of operation, our rates and additional services, including dog grooming, location and maps, as well as testimonials from happy clients. Four Paws is a premier boarding facility located in Brooksville, Florida, and services Hernando county dog owners including residents of Spring Hill, Weeki Wachee, Aripeka, Bayport, Brookridge, Hernando Beach, Lake Lindsey, Masaryktown, Nobleton, Pine Island, Ridge Manor, Spring Lake, Timber Pines, Garden Grove, Hill ‘n Dale, and High Point, as well as residents in the surrounding counties of Pasco, Citrus, and Sumter.